With the first two stages of the 2014 Tour de France taking place in Yorkshire, many cyclists have felt a keen urge to follow the Tour routes. 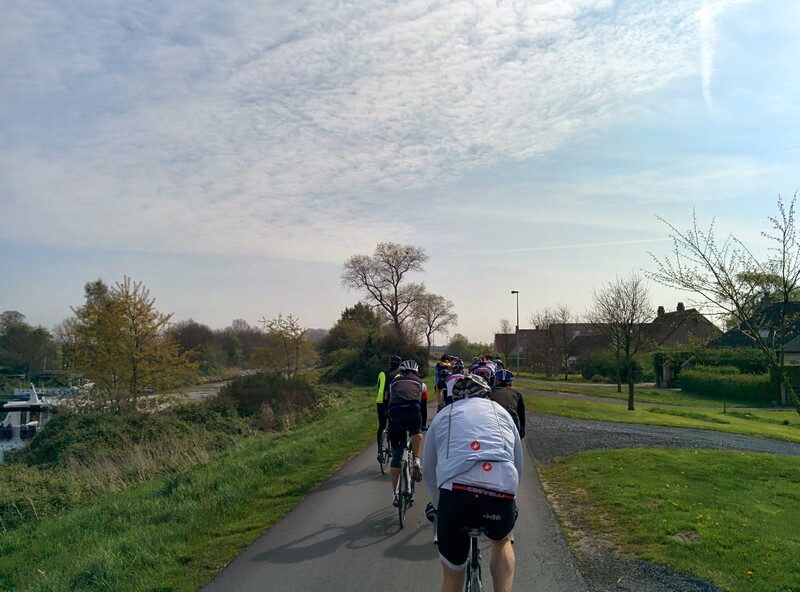 One newspaper estimated that ‘At least 30,000 cyclists have descended on the Dales to ride the route…’ To mark the Tour, it was proposed that the Club should cycle Stage 1 from Leeds to Harrogate. 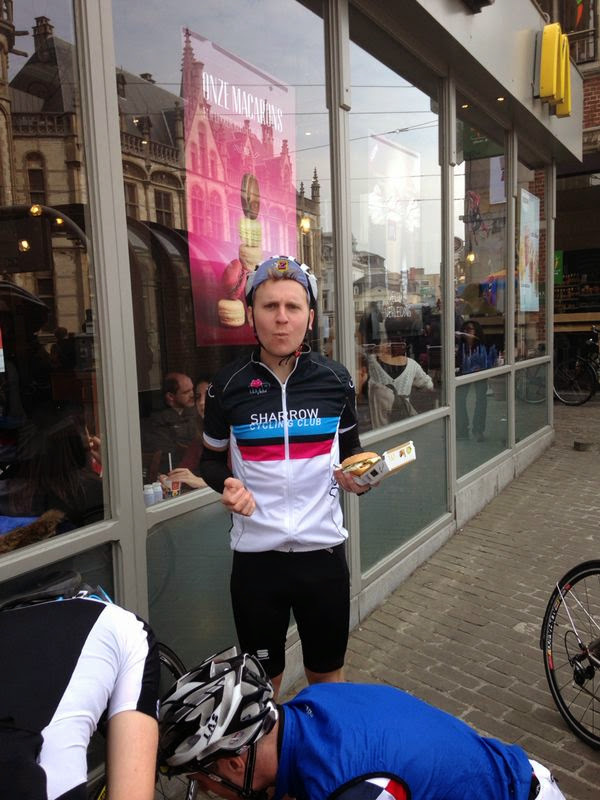 Roger Donnison suggested that by cycling the 120 mile Stage 1 over two days, with an overnight stop in Hawes, would ensure a more leisurely pace and include café stops. 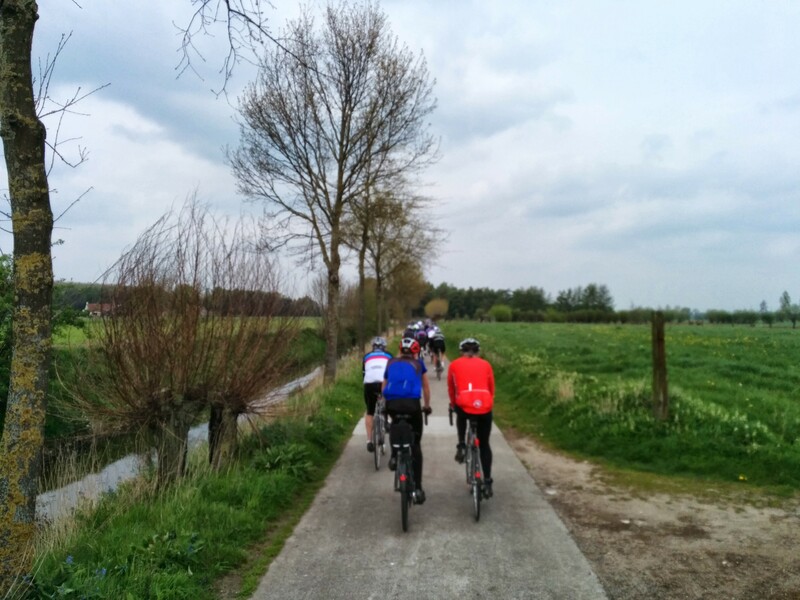 The original intention was to follow the exact route of the Tour, however, feedback about the heavy traffic, speed and dangers of cycling along the A61 and A65 persuaded Roger to investigate alternative minor roads that run roughly in the same direction. In the end, Roger devised a novel clockwise circular route starting and ending in Harrogate, which avoided the A65 around Otley and Ilkley on the leg out to the west of Harrogate, and the A6108 and A61 heading south from Masham and Ripon to Harrogate on the return journey. In addition, instead of following the Tour route from Buckden to Hawes via Aysgarth, Roger suggested an alternative shorter but higher route via Langstrothdale. The date for the Yorkshire Dales Tour was set for 21 and 22 June 2014 and club members Mike Walters, John Collins, Roger Donnison and Matt Hayman were joined by two 6 foot 3 inch giants, Paul Bliss, who clearly follows the great Robert Miller by always remaining in the saddle when going up hills, and Peter Lathey, whose speciality is demon descending! 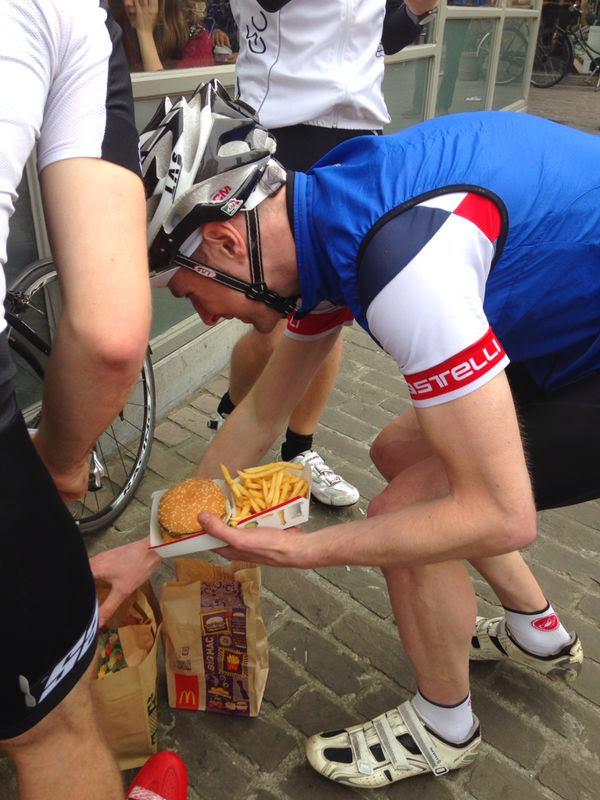 Peter Fauset was unable to cycle due to his accident in March, but he agreed to drive the support vehicle and carry the bags, as well as joining the important social side of the trip. The group set off to the south west from Harrogate along the B6161 towards Otley, which included the first major descent near Leathley. From Newall, north of Otley, the route followed the north side of the River Wharfe along flattish minor roads. To the north of Ilkley, the route proceeded along a single track road with very few passing places and then through Nesfield to Bolton Bridge where we made our first café stop. While sitting outside enjoying our lunch, a veteran cyclist wearing an ancient Fagor cycling jersey descended on our table saying ‘Nah then, where you lads from?’ The gentleman appeared to take a fancy to Sharrow’s cycling jersey and informed us he was a masseur, whereupon he decided to practice his craft on the nearest victim who happened to be John Collins. Approaching John from behind, our man started to manipulate John’s neck and shoulders, informing John he was tense. Whilst too polite to manoeuvre himself from the masseur’s engagement, John pointed out that he had seventeen pieces of titanium in his back, neck and face. Undeterred, however, the man continued to apply further pressure, releasing his grip only when his colleague shouted to him that it was time for them to leave. He promptly said his goodbye and left John in peace but no better for the experience. From Bolton Bridge the road followed the Tour route, the B6160 via Grassington to Kettlewell, where we stopped at the Cottage Tea Room for afternoon tea. We left Kettlewell for Buckden where we turned onto the minor road to Langstrothdale. This road starts off as a lovely meandering fairly flat minor road following the course of the River Wharfe but, as Peter Lathey commented, the big climb he dreaded mostwas Buttertubs Pass but what he was not expecting was the fearsomeFleet Moss. While groveling for his lowest gear, Peter found Matt Hayman – the youngster in our group – dancing on his pedals andstill turning his big chainring! It was a brutal climb, rising viciously on several occasions, so much so that Peter had to stop twice on the way up to get his heart rate down and to cool off by drinking plenty of water. Mike Walters observed that the nasty surprise was that the steepest bit was so close to the summit and how he and Paul Bliss had helped each other over the top. 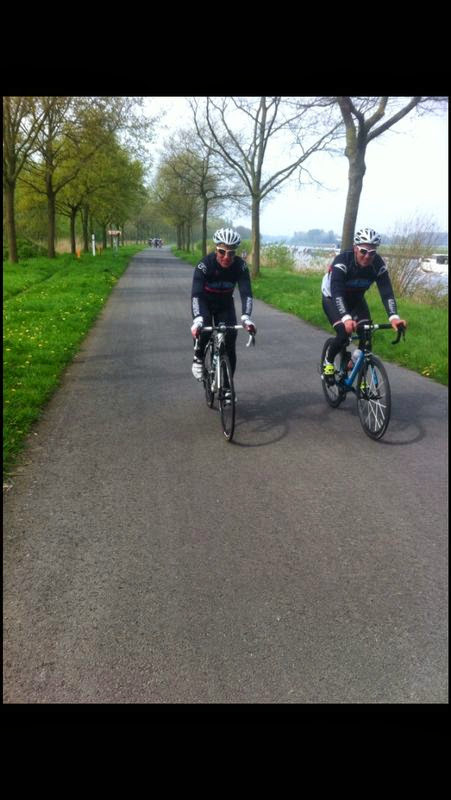 Coming at the end of a long day, Mike said the climb sorted his legs out! To his surprise, however, John, who had earlier claimed to be tiring and might get off, reached the summit ahead of both Mike and Paul. In his book 100 Greatest Cycling Climbs, Simon Warren notes that Fleet Moss is ‘the highest road in Yorkshire’ and ‘a beast in either direction’! As one of the very steepest roads in Britain, he has rated it 9 out of 10. So, for our group of mainly veterans, conquering Fleet Moss without pushing their bikes up the pass was an extraordinary achievement. An exhilarating rapid steep descent brought us to our first day’s destination, Hawes, where we stopped at a cafe for a cup of tea and tea bread with Wensleydale cheese. While ordering, the cafe lady suddenly declared ‘and you’ll be needing this as well’, as she handed over seven bottles of water. Such is the kindly concern of strangers!Hawes has a lovelytimeless feel to it, with its vernacular architecture built with indigenous stone, its part cobbled main street and old fashioned shops with quaint names, such as Elijah Allen and Sons. We then checked in at the Youth Hostel. For those of us from a more mature generation, more used to staying in 3 or 4 star hotels with en-suite bathrooms, the facilities of the hostel proved to be an interesting experience! While checking in at the tiny reception area one could not help notice the products for sale, such as combs or toothpaste which came in white paper bags at 50 pence each, and next to the postcards were, shock horror, bottles of beer and wine! Of course in a youth hostel you have to share a dormitory, in our case there were four sets of double bunk beds, some small lockers and two easy chairs. Down a long corridor there was one gentlemen’s bathroom containing two WCs, three showers, a row of four wash basins, set low down for the use of children with tiny 4 inch square mirrors above. Needless to say, the bathroom heaved with tightly packed sweaty bodies after a long hot day in the saddle or rambling on the hills. The three course dinner was good and we shared three bottles of red wine at only £8.45 per bottle. 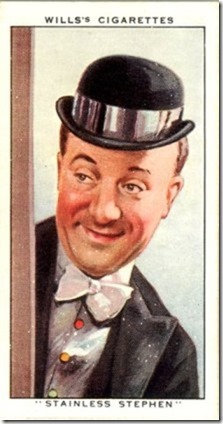 In the middle of the night, Peter Fauset felt the call of nature and had to slip out into the corridor to avail himself of the facilities of the gent’s bathroom. Wearing only briefs, he emerged from the bathroom into the corridor only to face a well-dressed middle–aged lady with a floral dress and handbag. Both were startled by the embarrassing encounter, but Peter could not help wonder what on earth was this lady doing there at 3 o’clock in the morning! As expected,the gents bathroom was busy again the following morning with all showers and WCs occupied! The Dining Room was crowded with mainly men aged between about 45 and 65, although there were two ladies present, neither of which was the mysterious lady Peter Fauset had met during the night! Interestingly, although one assumes youth hostels are primarily intended for young people of modest means, this hostel not only had a more mature clientele but also a more wealthy one, judging by the big new Jaguars, BMWs and Audis in the car park. Times have certainly changed! However, there is no denying that for around £39 for dinner, bed and breakfast per person including wine, the youth hostel was remarkable value for money. Mind you, in keeping with tradition, you did have to provide your own soap and towel, and make your own bed! Sunday morning was glorious as we emerged from the hostel to start the return journey back to Harrogate. Mike commented that the tone of the day was set straight away with the start of the climb of Buttertubs Pass after only a couple of miles, so no warm up then! He found it a different kettle of fish to the previous day’s climb with most of the really steep climbing lower down and long open stretches towards the summit. 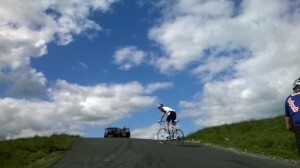 Simon Warren describes Buttertubs ‘as brilliant to climb from either direction. The south side kicks up steep then gradually alleviates as it approaches the top…’ Warren gives it a rating of 8 out of 10. 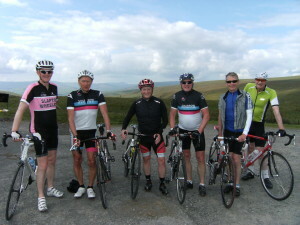 At the summit, the group posed for photographs before the steep and fast descent to Thwaite in Swaledale. The group then headed east through Swaledale to Reeth along the B6270. Shortly after Muker, Peter Fauset noted a yellow car had been following him and was moving in even closer. As Peter pulled over to allow the car to pass, he was taken aback when the driver stopped, hemming him in and, with full-on eyeball-to-eyeball contact, delivered a vitriolic attack against cyclists before storming off ahead. Clearly, stirred on by his show of cyclo-phobia he quickly caught up with the group and instead of smoothly overtaking them, deliberately drove into them, remonstrating with Matt for slowing him down. Furthermore, the hostility towards cyclists continued in Gunnerside when a woman with three dogs took it upon herself to shout ‘Single file please’!!! Despite the ugly confrontations, our group was neither shaken nor stirred and the journey down Swaledale was most pleasant following the River Swale within a backdrop of high hills and rocky outcrops. The road is gently undulating and meanders through attractive villages, occasionally passing over old narrow bridges and for much of its length is bordered by stone walls on either side. The only disturbing feature at the time we passed through was the number of dead young rabbits, as well as hedgehogs and occasionally birds. Eventually we came to Reeth, the largest village in the dale, set around a large, sloping, triangular green. Here we adjourned to the Copper Kettle for coffee and cakes. Shortly after leaving Reeth we came to Grinton and left the B6270 to head south east along another minor road to Leyburn. Unfortunately, this road also included another steep climb, Grinton Moor, which came as a surprise to Mike who described it as a bit of a grunt of a climb, although it was not as severe as Fleet Moss and Buttertubs Pass. There was however a nice descent to Leyburn where we joined the A6108 for Masham, passing through attractive Middleham with its castle. The landscape here was more undulating and lush green with more trees and woods compared with the sparse moors and valleys we had previously been through. Being an A-road meant the road was much wider and carried more traffic. About 5 miles out of Leyburn near Jervault Abbey there was a short, sharp incline, Abbey Hill. 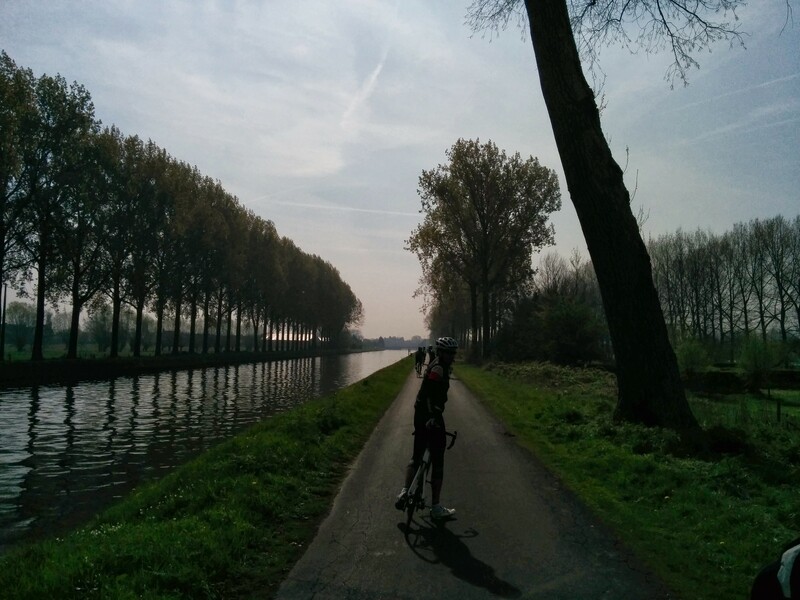 Matt powered up the hill without changing down from his chainring and soared ahead. Roger and John managed to keep their momentum and managed to get back on Matt’s wheel, but try as he might, Peter Lathey just could not close the gap on them for the next 7 miles to Masham. On arrival at Masham, Matt, Roger and John seemed as cool as cucumbers whereas Peter was hot, sweaty and exhausted. Masham was very busy with other cyclists, motorbikers and weekend motorists, and we had difficulty finding a café that was not full. The last leg of our tour went south from Masham following a sequence of minor country lanes to Harrogate. 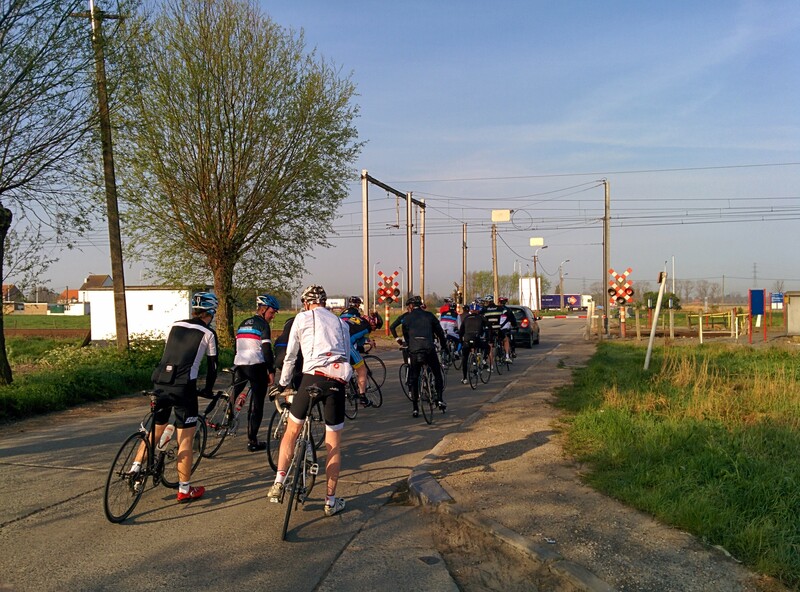 There was hardly any traffic and even fewer bicycles. The landscape was gently undulating, ‘a bit up and down’, as Roger put it. The area was mainly agricultural, containing some country estates, but possibly the least interesting part of our tour. After Grewelthorpe, the route passed through Kirkby Malzeard, Grantley, Sawley, Bishop Thornton and Shaw Mills. At the next place, Hampsthwaite, Roger suggested we stopped for afternoon tea at the delightful Sophie’s Coffee Shop and Delicatessen. It was a good choice as we had some excellent tea and cakes in a pleasant walled garden. 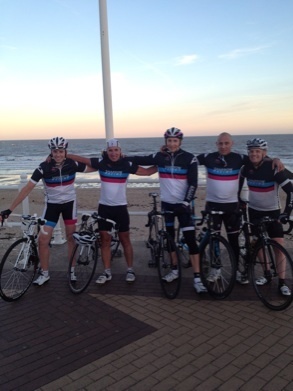 It was then only a short ride to Harrogate where we completed the tour. There was a sense of exhilaration on completing what had been a wonderful tour and a great feeling of achievement to have climbed Fleet Moss, Buttertubs Pass and Grinton Moor. Matt’s Garmin GPS computer recorded a remarkable total ascent for the two days of 1,450 metres, about 4,500 feet, of which Mike said, ‘I’m rather proud of that’. 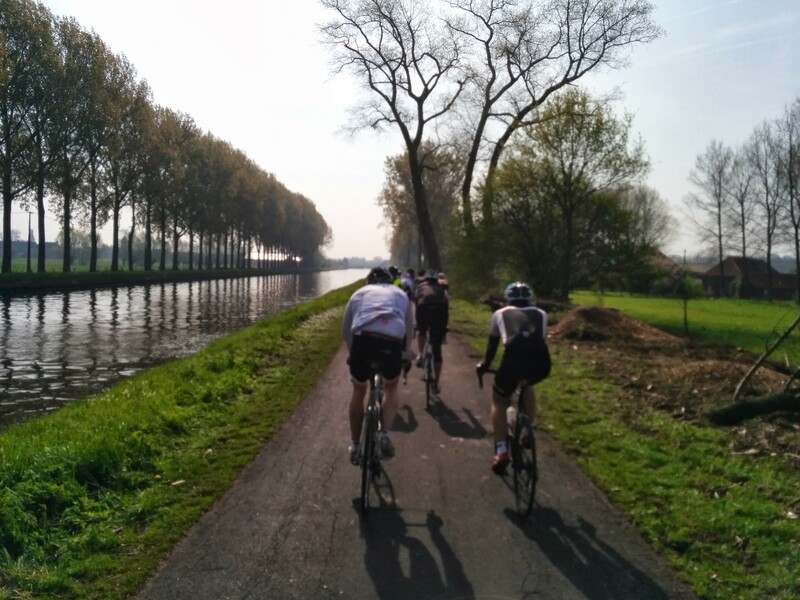 We had been lucky with the weather, the scenery was outstanding, the target of 60 miles per day was just right considering the steep climbs, there was generally little traffic on the route, we stopped at some excellent cafes, and we didn’t have any punctures! It was such a great success that John suggested a tour of this nature should become a regular feature in the Sharrow Cycling Club calendar and said he would put it to the next meeting of the club. 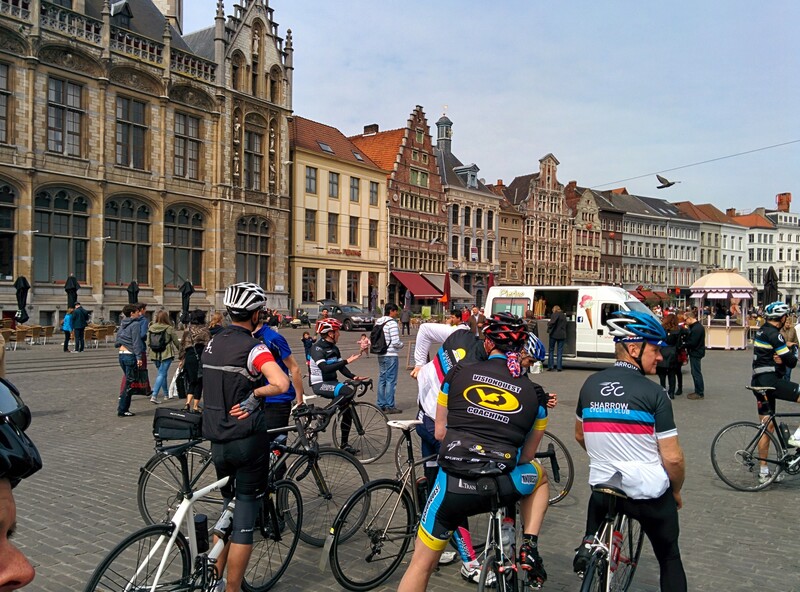 Many thanks should go to Roger for putting forward the idea of cycling the Tour route in the first place, for booking accommodation, for devising and carrying out a recce of the route, and for remarkably trusting Peter Fauset not to crash his automatic VW Golf! Peter Fauset, with contributions from Mike Walters and Peter Lathey, and editing by Roger Donnison. Photographs by Matt Hayman and Peter Fauset. 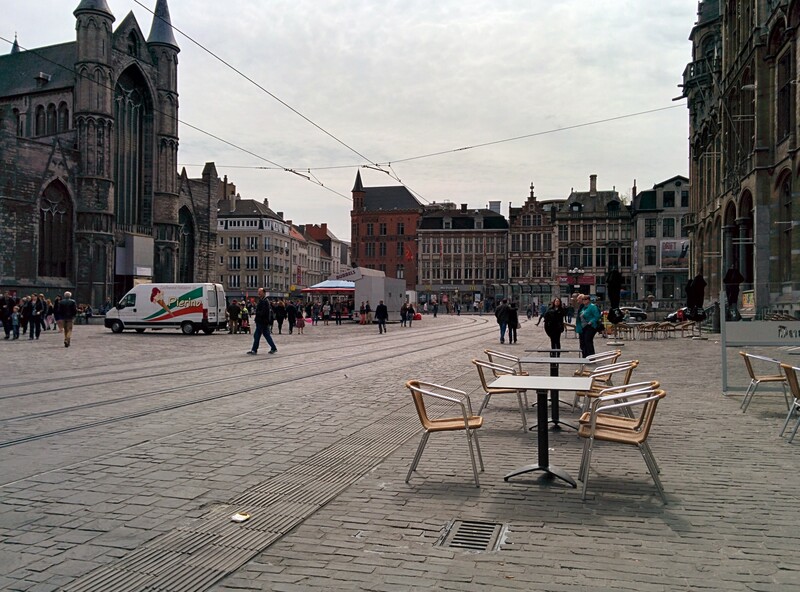 Belgium 2014 – in pictures! 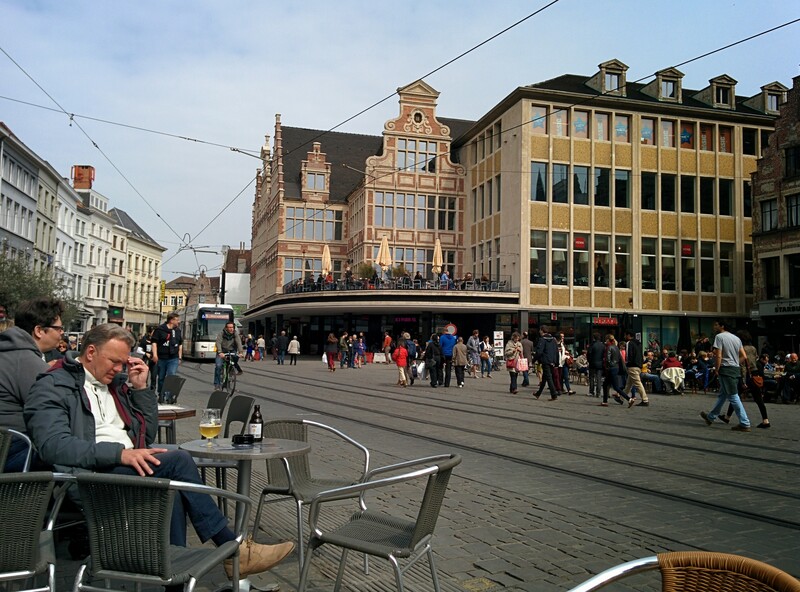 Some of the pictures from our excellent trip to Belgium… enjoy! This year sees the commemoration of the start First World War in 1914. With this in mind, I have been looking through some of the early Sharrow Cycling Club archive material. Amongst this, I came across a scrapbook of newspaper cuttings, race programmes and Annual Dinner programmes. One cutting, titled ‘Cyclist Soldiers’ refers to a special Victory Dinner which took place on Saturday, 29th November 1919, given to honour the Sharrow members who served in the conflict. 18 members went to war, two were killed in action. I reproduce the full original article as printed. Very interesting historically, it captures the spirit and attitudes of the time. Sharrow Cycling Club warmly welcomed the return of ex-soldier members of the Club at a dinner given in their honour at the King’s Head Hotel, Sheffield on Saturday night. The Club has a membership of between eighty and ninety and the returned warriors number sixteen. Two members were killed in the war. Before the social proceedings commenced, all stood in silence in remembrance of those who sacrificed their lives in honour of their country. Mr W E Cope, representing the NCU, said they did not forget when the buzzers were going in Sheffield. The man who gave his life for his country could give no more, and no more could be asked of him. He was prouder today of the Sharrow Club, observed Mr Walpole Hiller, than he had ever been and he had joined the Club a week or two after it was formed in 1887. He was proud to feel that they had such brave fellows in the Sharrow Club and if the cry came tomorrow to help their country, the boys of the Sharrow would say, ‘ Here I am, take me again’. (Applause) They had had thirty dinners but never one such as on that night. They were glad to see the boys home again and hoped there were many happy days in store for them. Trooper Warner, after relating some rough experiences on the Somme Front, said that was a night they had thought of many a time, and they often wondered if they ever would reach such a stage. They had only done their duty and if there had not been ‘indispensable’ people at home they would have had a poor time at the Front. The proceedings, interspersed with songs, duets solos and stories were of a thoroughly enjoyable description. D. Smith Royal Flying Corps. T. Brookes Army Service Corps. during his cycling career. 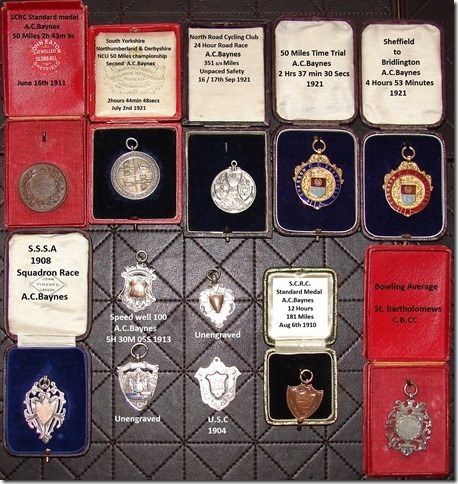 These were kindly donated to the Club by his family after his death in Leeds 1977. Bridlington record, failing by just 1 min to break the record with his time of 4 hours 37mins. He rode the North Road ’24’ hour race on three occasions. Clearly a formidable cyclist. During the four war years, all Club events were abandoned although Club runs continued. Funds were raised for various War Funds, the Lord Mayor’s Relief Fund and monthly parcels were sent to each serving member. The Club’s Headquarters had been at the Imperial Hotel for many years but in 1914 this was moved to the Brincliffe Oaks beginning a long association with the hotel. It is with great sadness that we report the death of one of our members, Keith Hayman. Keith was a much-respected and active member of the club who tragically suﬀered a heart attack on Ecclesall Road South while returning from a club run to Edale on Wednesday, 18 September 2013. 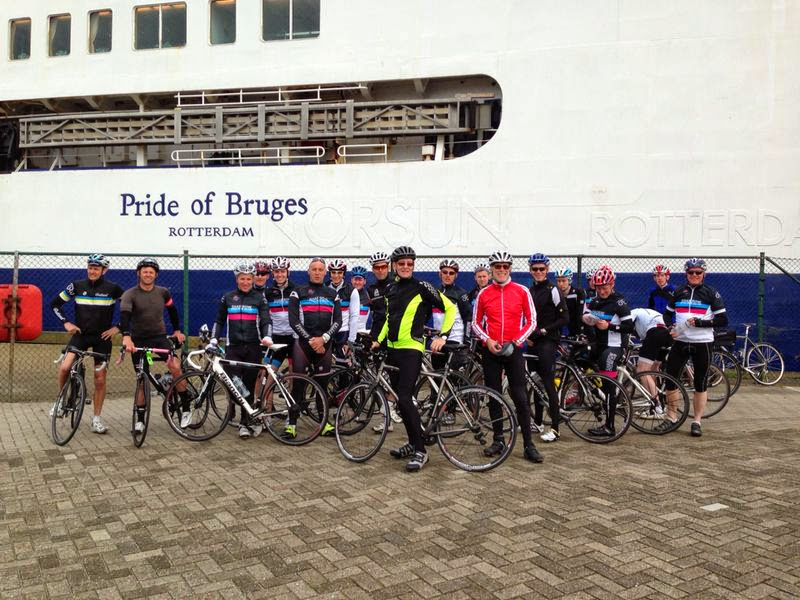 As well as a regular participant on Wednesday club runs, Keith attended most club meetings, he took part in the club’s annual cycle trips to Holland in April and the Bridlington run in October. 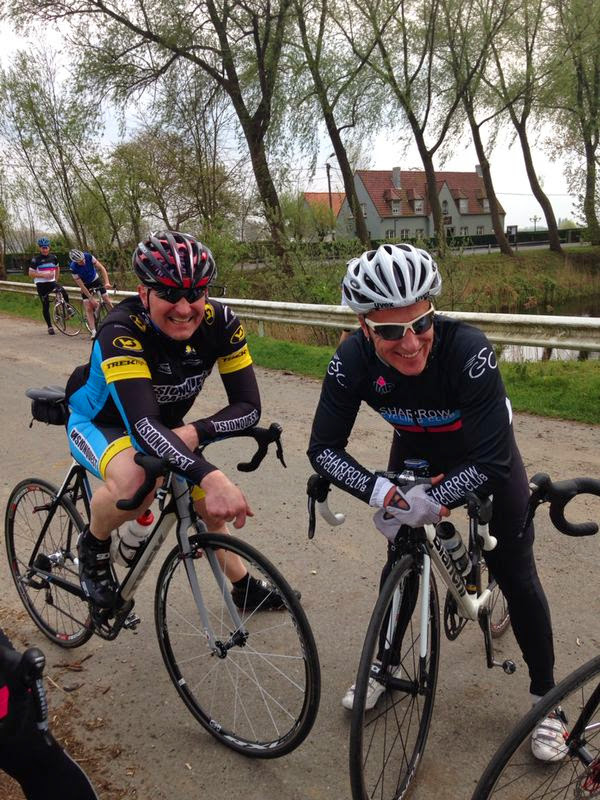 On two other occasions he took part in the Etape Caledonia, an 81 mile cycle sportive based around Pitlochry in Scotland in May, and was a marshal for the club on the annual High Peak Road Race in August. 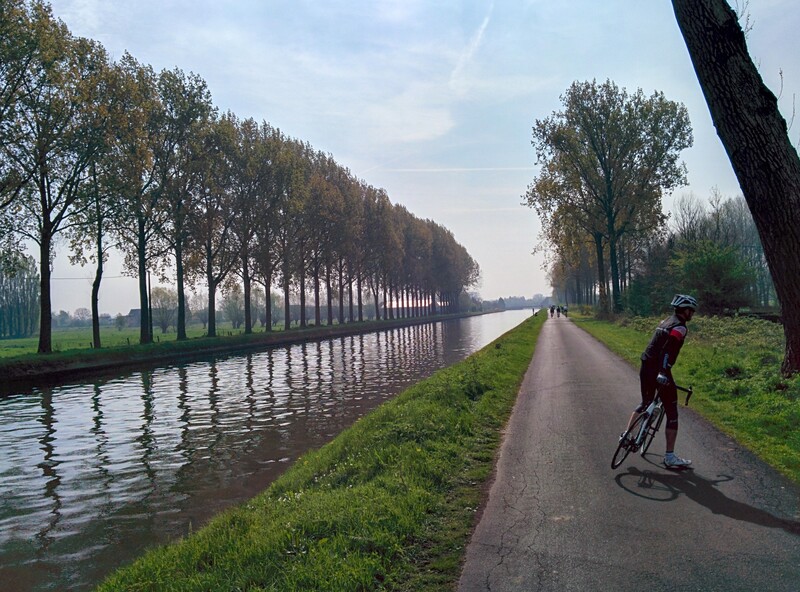 A couple of cycling trips in which Keith participated are more unusually memorable……. Sharrow Cycling Club was established in 1887, making it the oldest cycling club in Sheffield still in existence. 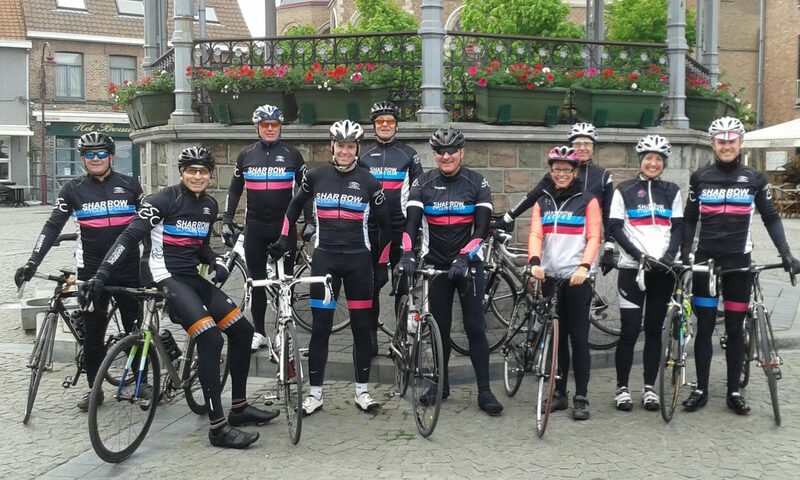 Today we are a dynamic cycling club offering 3 weekly club runs, trips, events and racing. 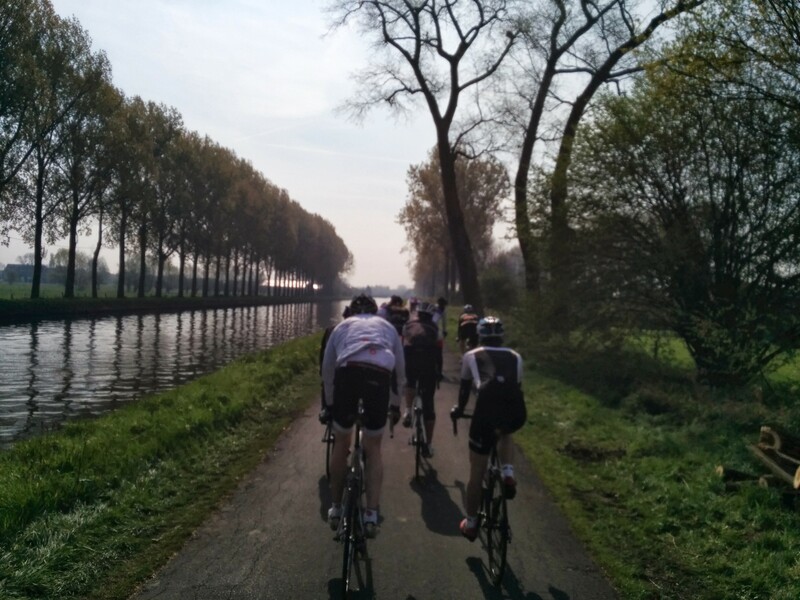 A typical Sunday club run ranges from 40-60 miles with an average speed of around 14mph, so we expect a good level of fitness. Saturday rides are generally longer and quicker (60-80 miles, 17/18mph) than Sundays and usually leave from Ella’s cafe at Hunters Bar. 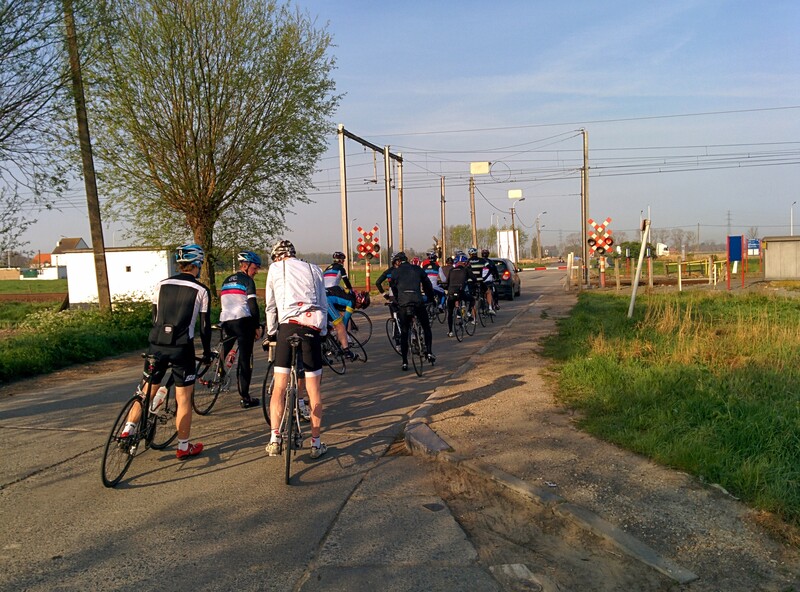 Club runs are informal club runs where everyone is welcome including juniors. In order to attend club runs unattended juniors must seek permission from their parent/ guardian who must sign the club run attendance permission form. 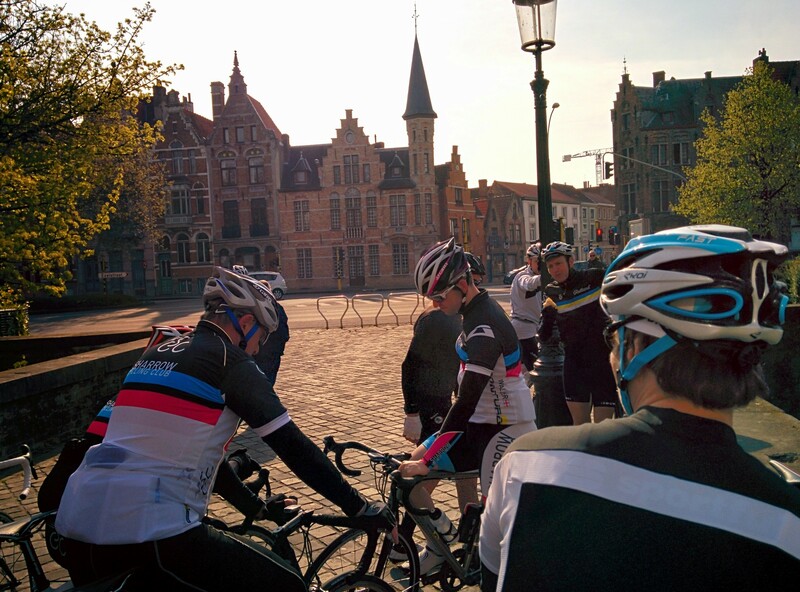 As well as the regular rides, the club also organises cycling events, trips and socials. Interested? Then come along and give it a try. 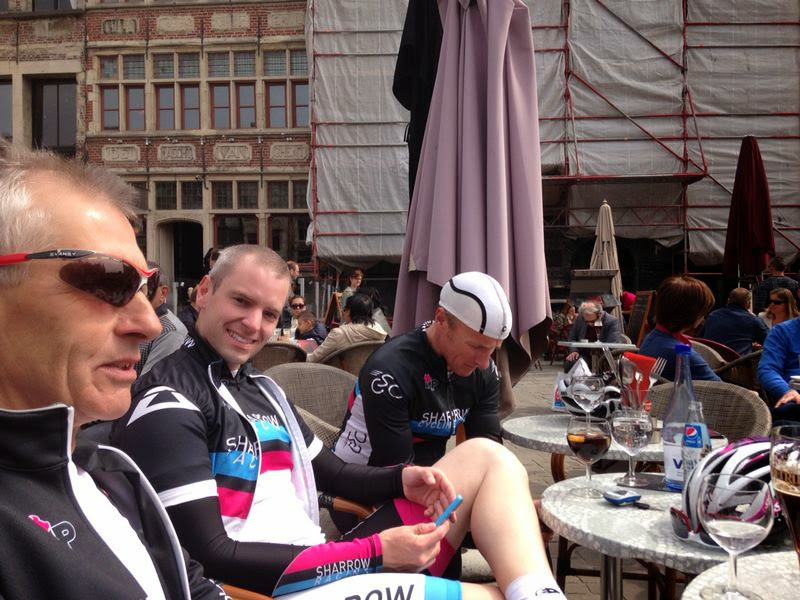 The Sharrow Cycling Club, its members and officials adhere to the British Cycling Code of Conduct. By joining the club members agree to abide by this code. 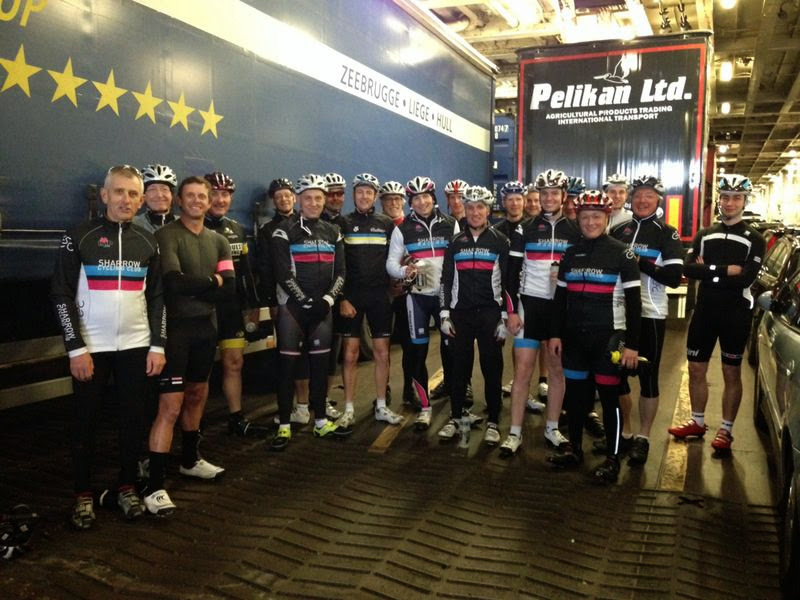 Full details of can be found on the British Cycling Website.